Zeto -- The wine destination! Zeto - Greek "Live, long live!" Toast "Zeto!" Save 15% on Fermob from April 2 - April 16, 2019! Upfit your outdoor space with exciting Fermob colors and designs! Fermob for homes, condos, apartments, schools, parks, patios, anywhere people enjoy getting together. 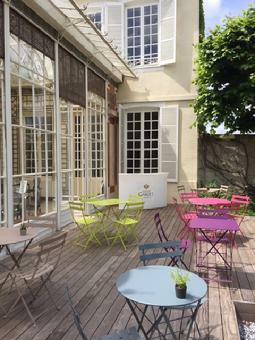 Fermob Bistro tables and chairs at Champagne Gardet in France. Call or come by Zeto wine shop in Greensboro, NC to see these and many other Fermob products. See these and more Fermob happy garden furniture items at Zeto in Greensboro, NC. Zeto -- a Fermob Partner Dealer! 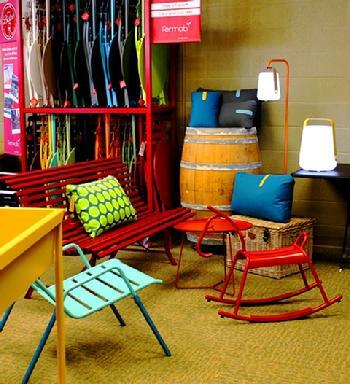 See our Fermob Bistro tables and chairs, Balad lamps, the "comfy" Sixties chair and more. for your deck, patio, porch. . .
anywhere you want to create a happy outdoor setting with lovely, durable furniture! Already know what you want? Email us the item(s) you want, number of each, color for each, and your name, company name, address, email and telephone number. We will respond to your inquiry in a timely manner. Thank you. 336. 574 2850 Zeto 335 Battleground Ave. Greensboro, NC 27401 Corner of Lindsay St at Battleground, 1 block W of Marriott in Greensboro, NC in NoMar (N. of Market St.). Located within 1 to 2 blocks of Greenway at Fisher Park apartments, Greenway at Stadium Park apartments, historic Fisher Park, Westerwood neighborhoods and 1-2 miles of Irving Park, Sunset Hills, & more nearby residential areas. Email: Zeto@ZetoWines.com We reserve the right to correct typos. Thank you. Open: Mon. - Wed. 10 AM - 6 PM Thur. & Fri. 10 AM - 7 PM (except when we have special events) Sat. 10 AM - 5 PM. We are closed on major holidays including, but not limited to, Christmas, New Year's Day, Easter, Memorial Day, Fourth of July, Labor Day. Small production wines. Fermob Bistro & other patterns of Fermob happy garden furniture. Wine cellars (design & installation), wine cooling units. Gift baskets. Corporate gift baskets. Specialty foods & cheeses. Gift certificates. Wines by the glass from our VinoMatic self-serve "wine wall" using your VinoMatic vending card (see our casher for yours). Text, photos, and other aspects or features of this web site may not be copied nor in reproduced in any manner or by any technology without written permission or written agreement from one of the Zeto, Inc. officer (Zeto, Inc. in Greensboro, NC)..
2019 Copyright Zeto, Inc. All rights reserved.